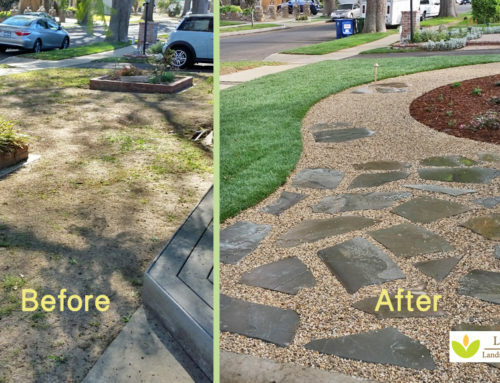 Multi-use Dog Run for Eagle Rock Resident -- Linda Vista Landscape Services, Inc. Many Eagle Rock, California homes have unusually large lots for the Los Angeles area. This resident took advantage of the extended space. He had a dog run installed and asked for a multi-use design that is both lushly green and completely practical. Knowing the end result, it’s hard to believe we started out with just a large swath of untended, unhealthy grass. And because of the California drought with water restrictions, it had been very difficult to give it enough water to have a chance to look good. All the grass, down to the roots, was removed. A big job! Removing the grass down to the root system is important to help avoid “grass shooters” later on. This can also minimize herbicide use. After the grass was removed, the area was leveled. The taller trees lining the side of the yard were not removed. But, other shrubbery and free-standing starter trees were taken out to accommodate the new design. The remain space was divided into three areas: 1) planters, 2) turf, and 3) dog run. Planters: Bender board and premium bark chips were installed to define the planters. Drought-tolerant perennials were planted, with automatic drip irrigation. With the deep watering from this new irrigation system, the plants could still be colorful and healthy even during the drought. Turf: Artificial turf was installed. Doesn’t it look completely real? It adds beautiful greenery for aesthetics or small play area. Dog run: The diagonal use of the space creates a visually striking appearance yet also allows for a longer dog run. It’s also practical for doggy “doo” cleanup and ball-throwing play. The run is composed of compacted DG as the base.